The David Dio Hair Studio in Hamden held a Cut-a-Thon this past Sunday, offering $20 haircuts and $15 pink hair extensions. All proceeds were donated to the American Cancer Society’s 2010 Making Strides Against Breast Cancer Walk. People filled the salon for haircuts and pink extensions at a discounted price from 9 a.m. to 5 p.m. Customers also had the opportunity to help themselves to snacks, wine and a free massage at the Dolce Vida Medical Spa next door at their open house. If the salon couldn’t accommodate some of the walk-ins, they were given a card to come back at a later date and still receive the $20 cut and donate to the American Cancer Society. Mrs. Dio has spent four years on the Making Strides Against Breast Cancer Walk committee, and this was the second time their salon hosted the Cut-a-Thon. Her sister suffered from stage 4 breast cancer six years ago, which recently came back and spread to her bones. 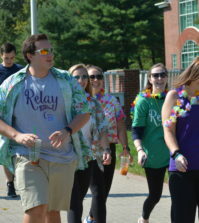 “I think most people have been directly or indirectly impacted by this disease, which is why we are able to gain so much support,” Mrs. Dio said. Yale Divinity School student Abby Ferjak went in support of her best friend whose mother is a survivor. “I figured if I am going to get a haircut why not do it here where my money is going to something effective,” Ferjak said. Customer Elizabeth Wilkinson has an aunt who survived breast cancer. The event raised over $1,500 and attracted more than 100 people this year. 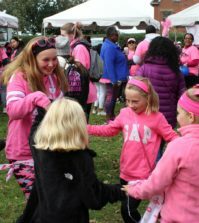 The Making Strides Against Breast Cancer 5K walk will be held at Lighthouse Point in New Haven on October 24. Registration begins at 11 a.m.